This article first appeared in The Edge Financial Daily, on October 10, 2016. KUALA LUMPUR: What investment strategy is best in a listless market? As the benchmark FBM KLCI seesawed its way through the first nine months of this year, some analysts believe market timing and trading could be key as market volatility is expected to heighten in the run-up to Budget 2017, the US presidential election and a possible US Federal Reserve rate hike. The FBM KLCI has been trading in a 52-week range of 1,600.92 points to 1,729.13 points. But year to date, it has remained relatively flat, falling 1.6% to close at 1,665.38 last Friday. According to Inter-Pacific Securities Sdn Bhd research head Pong Teng Siew, investment success requires speedy shifts in the current market conditions. “It’s been a very tiring year. The FBM KLCI has not been doing very well. Even the ACE Market [of Bursa Malaysia] is not showing very good returns. Stock picks and ideas for 2016 only work for a relatively short period of three to six months. The ideas won’t work throughout the year. I think trading is the name of the game for 2016,” he told The Edge Financial Daily in a telephone interview. Pong believes a bottom-up strategy, in which the emphasis is on a given company’s performance, is a suitable investment approach in the current environment as it is difficult to predict the overall trend of the market. He also noted that equity investing in 2016 is all about timing. “Investors who entered the market in January would have seen significant gains, but those who had invested since end-2016 and held on to the stocks would have seen a slight loss,” he said. Recall that 2016 was a discouraging start for the local bourse, dragged down by the massive sell-off in Chinese stocks. The FBM KLCI fell by 5.4% to 1,600.92 points in just 21 days into the new year. The market staged a rally on April 15 when it breached the 1,700-point psychological level to 1,727.99. However, the rally was short-lived as the index plummeted to 1,614.90 on June 16. Those who had invested at its high could have lost as much as 3.6%, while those who had invested at its low at the beginning of the year could have gained as much as 4%. “Take profit if you make some gains. I think this should be the strategy in a flat market,” Pong added. Pong is also of the view that the oil and gas (O&G) sector remains a wild card for investors at this stage despite the Opec agreeing to cut production, adding that the US is now the largest oil exporter in the world. Should the global supply of oil be successfully reduced, there will be more interest in the FBM KLCI as a whole, especially in the O&G sector, he added. Etiqa Insurance & Takaful head of research Chris Eng shares the same sentiment as Pong, expecting some excitement to return to the O&G sector if production cuts by Opec members manage to sustain oil prices. Brent crude oil prices were down 1.2% to US$51.86 (RM215.22) per barrel last Friday, while US West Texas Intermediate futures settled down 1.3% at US$49.81 per barrel. Chris also noted that stock picking is best in the current market conditions, adding that liquidity is key when picking companies as the outlook remains uncertain. “I am quite positive [on outlook for the stock market] for this month but I am a bit cautious about next month, which is when we will see the US election and a potential US interest rate hike. We continue to focus on stocks with high amount of liquidity,” he said. Still, Chris believes the current market conditions provide a good entry point for investors with an investment horizon of three years or more. UOB Asset Management (Malaysia) Bhd chief investment officer Francis Eng Tuck Meng, meanwhile, advocates a buy-and-hold strategy, suggesting that investors buy into companies with strong fundamentals, cash flow and value for investment and hold them regardless of market volatility. “Do your homework and find a good company to invest in, and then ride on its growth,” he said. Francis is of the view that Malaysia is in a sweet spot, particularly in the construction, palm oil and consumer sectors. “The Consumer Sentiment Index has started to adjust to the goods and services tax (GST), the weak ringgit and other negative sentiments. Consumer sentiment is looking up. “There has also been a rebound in crude palm oil prices recently and it looks like good news for the palm oil sector,” he said, adding that the construction sector will benefit from ongoing mega projects such as the mass rapid transit Line 2, the Pan-Borneo Highway project and the light rail transit Line 3. Yvonne Tan, general manager of investment services at Eastspring Investment Bhd, said it continues to adopt the bottom-up approach. “We have always looked at the market from a bottom-up approach. Some of the things that we look for are stocks offering high dividend yields,” she said. According to a report dated Sept 29, Nomura Global Markets Research believes that trading is the name of the game as the FBM KLCI enters into a period of increased volatility. It attributes the unexciting market performance year to date to the lack of recovery in corporate earnings despite their valuations not being cheap at 15.8 times its forward price-earnings ratio. 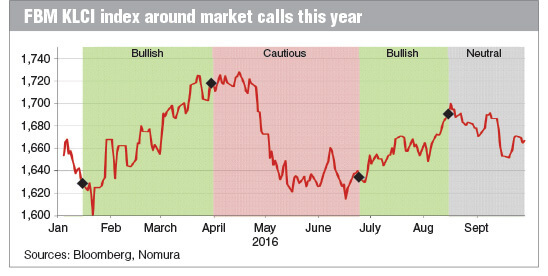 However, Nomura sees limited downside from foreign selling in the FBM KLCI as foreign positioning is quite light at the moment. It expects the FBM KLCI to end 2016 around 1,680 points and inch modestly up to 1,725 by end-2017. The foreign research house said in an environment of flattish trend returns, low differentiation and low visibility, capturing cyclical ups and downs in the market is an effective way to enhance returns. It said one local catalyst to keep in mind is the timing of elections, expecting gains around the event, usually starting 60 days before the event, to be the best period of upside for the FBM KLCI. 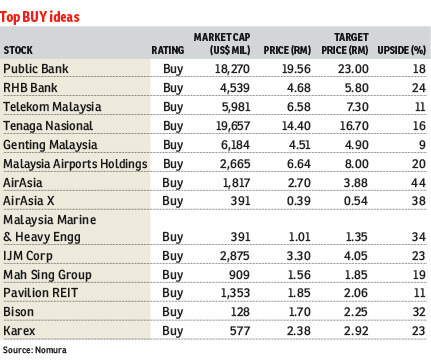 Its top stock picks are Public Bank Bhd, RHB Bank Bhd, Tenaga Nasional Bhd, IJM Corp Bhd, Genting Malaysia Bhd, Malaysia Airports Holdings Bhd, AirAsia Bhd, AirAsia X Bhd, Pavilion Real Estate Investment Trust (REIT), Bison Consolidated Bhd and Karex Bhd. However, Nomura advised that Malayan Banking Bhd, Maxis Bhd, Gamuda Bhd and IOI Corp Bhd are among the large-cap “reduce”-rated stocks that are best avoided for now. Meanwhile, it has an “overweight” call on the transports and logistics, REITs, consumer, healthcare and pharmaceuticals, gaming, hotels and leisure, and telecommunications sectors but is “underweight” on the O&G and financial sectors. According to Maybank Investment Bank Research (Maybank IB Research), defensive equity positioning is recommended such as investing in high yielding stocks and to position for the 14th general election (GE14) in the country during broad market weakness. The local research firm is of the view that the FBM KLCI will end the year on a positive note, taking it up to beyond the 1,700-mark with valuations lifted higher on any signs of an early GE14. The FBM KLCI saw a pretty good start to the October month with a gain of 12.83 points or 0.78% in just the first week. Maybank IB Research also said encouraging observations are made at the consumer sector. “At staples or retail or F&B (food & beverages), most have seen gradual recovery in sales since the second quarter of 2015’s GST implementation. Also, while softer raw material prices helped, most multinational companies have sharpened their cost efficiencies to drive bottom line growth,” it said in a Sept 2 report. The research firm added that sectors such as utilities, REIT and construction continue to be favoured, while cement and property are negatively viewed.